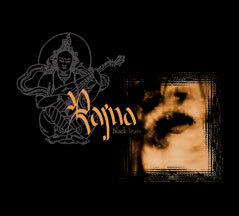 Rajna presents Black Tears, an intense retrospective celebrating the first six years of their career. The disc features 9 songs covering all their albums, 5 new songs (4 recorded in 2005 especially for this release), the massive “Buried Philae” remix by the electro-industrial masters Division Alpha, plus 2 exclusive rarities: spiritual “Sién” and surprising “Shushai.” Together, they create an 80 minute musical voyage. In partnership with the association “The House of the Himalayas” and Holy Records, Rajna will transfer the totality of their royalties to the building of a school for the children of Tibet. Black Tears is dedicated to the fans of Rajna and to all those who wish to discover the special musical universe of this French-Tibetan duet; throughout this opus, rediscover the scents of the East and Asia; the taste of spices which wake your senses, musical colors which hypnotize, echoing landscapes which transport you towards unknown regions; celestial, sensual, tragic, powerful and captivating voices which charm the hearts in search of sincerity. Rajna music is the incarnation of the true meaning of the word “trip:” a journey, a gathering, sharing, serenity, spirituality. Rajna is a bridge of perfect harmony creating a wonderful alliance between the earth (humanity) and the sky (paradise). From black tears emerges the light of our souls.